Hillyard Repel is a unique, non silicone formula that provides a durable, subsurface, transparent protective barrier against water and oil on porous surfaces such as concrete, stone, and grout. In colder climates, when water penetrates concrete and stone surfaces, it freezes and expands, creating the environment for chipping and cracking. Water and stains that would normally penetrate deep into porous surfaces are now kept close to the surface reducing the chance for water damage and stains. 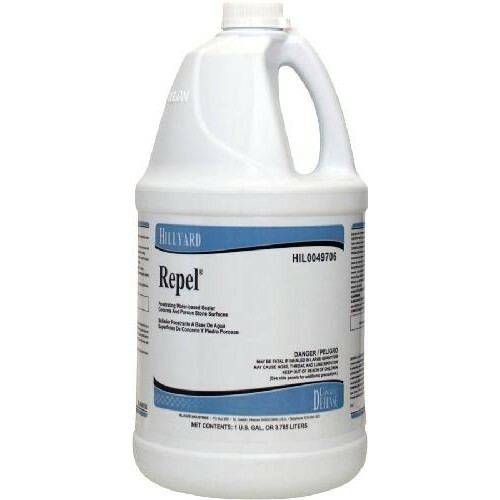 Treating concrete and stone installations with Repel ensures that surfaces are kept to a high standard of appearance with reduced maintenance efforts Hillyard Repels versatility makes it a great choice for a variety of applications. It can be used indoors on concrete surfaces to help repel dirt, oil, grease, and other stain causing agents such as coffee, or outdoors on driveways, patios, loading docks, and more. Repel applies easily with a saturated brush or roller. A mop can also be used to apply Repel to smooth surfaces. Clean up is a snap using warm water and a mild detergent. Hillyard Repel will not darken or yellow with age where it is applied and protects porous surfaces, making cleaning easier and less time consuming. It comes ready to work straight from the package and requires no mixing or diluting.